"The Onion Test" has become a common argument of junk DNA proponents.. This companion article presents data indicating humans have large amounts of functional DNA and that evolution cannot account for it. Some of the largest reported genome sizes don't report haploid genome size, or contain contamination. Genome size correlates with cell size. Genome size differences may represent tradeoffs between different forms of data storage. In some cases, some organisms with excessively large genomes may actually have large amounts junk DNA, created by runaway transposon duplication. However, misreporting and polyploidy certainly don't explain all variations in C-value among organisms. 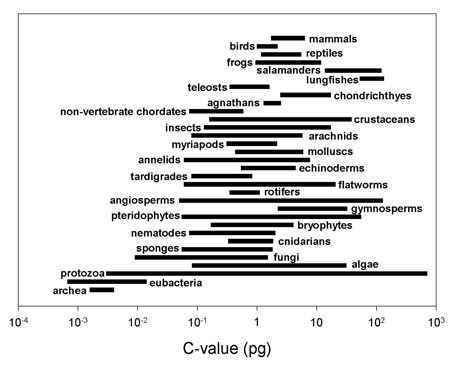 This figure from Lui et al, 2013[[lui-2013]] shows the ratio of noncoding (NC) DNA to total genome size (TG) in various organisms (A) and the percentage of non-coding DNA versus the number of cell types (B). In the figures above, viridiplantae are algae and plants, while metazoa are animals, with vertebrates being within the deuterostomia. It makes sense that more complex organisms (measured by number of cell types) would require larger genomes. The figure below shows a correlation between genome size and cell size in various taxa, composited from Beaulieau et al 2008 figure 3[[beaulieu-2008]] and Gregory 2001 figures 1 and 3. [[gregory-2001]] "Angiosperms" iincludes all flowering plants, including flowering trees. Reptiles, birds, and mammals show a weaker correlation because their cell sizes vary less than the other groups. Among our own designs it's common to see tradeoffs between size, speed, and other limitingn factors. A familiar example is in image compression where decoding and encoding speed also come into play. The png image format offers a small size without loss of image quality, but most computers are not fast enough to record a video where every image is saved as a png file in real time. 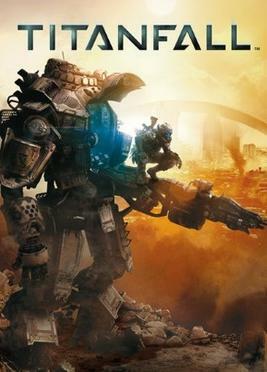 An opposite extreme can be seen in the PC game .kkrieger,[[kkrieger]] a first person shooter with detailed graphics and sounds that requires only 96KB of disk space--500,000 times smaller than TitanFall, and a shocking three times smaller than the onion.jpg above. The .kkreiger developers created all sound effects, music, textures, and 3D models through fractals--the tradeoff being a lack of nuanced control over artistic assets. Transposable elements (also known as transposons or TE's) are stretches of DNA that can copy and move (transpose) themselves to new locations in a genome. They increase their number in doing so and can even copy themselves relatively quickly. In some taxonomically restricted cases of large genomes, the excess may actually be due to runaway transposon duplication and would therefore be true junk DNA. 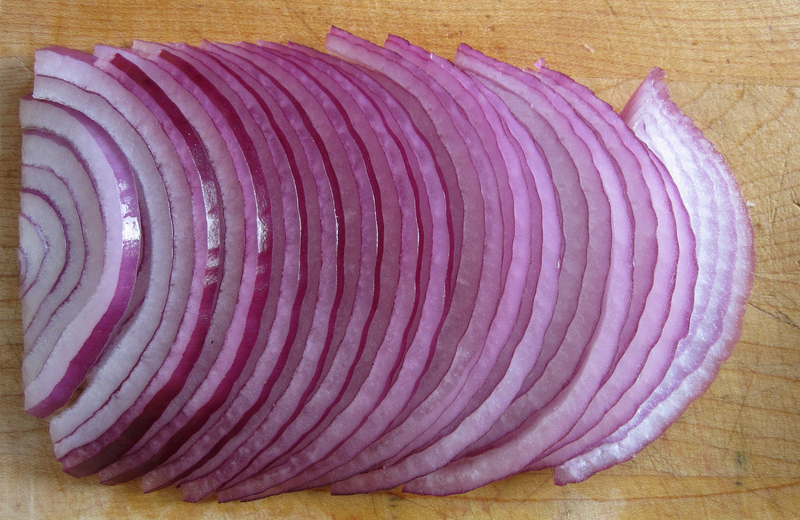 This may be the case with onions of the genus allium, which range in genome size from "7 pg to 31.5 pg"[[gregory-2007]] It may also be the case that organisms with similar genomes (such as the various species of salamanders) are prone to the same factors leading to runaway transposon duplication. However, the cases like onions cannot be used to argue that most DNA in most eukaryotes is junk. Mammals for example all have close to the same genome size. [[crick-1980]]Crick, Francis and Leslie Orgel. " Selfish DNA: The Ultimate Parasite." Nature. 1980. [[lui-2013]]Lui, Guosheng et al. "A meta-analysis of the genomic and transcriptomic composition of complex life." Cell Cycle. 2013. [[comai-2005]]Comai, Luca. "The advantages and disadvantages of being polyploid." Nature. 2005. [[cavalier-smith-1999]]Cavalier-Smith, T. et al. "The skeletal function of non-genic nuclear DNA: new evidence from ancient cell chimeras." In "Structural Biology and Functional Genomics." Springer. 1999. [[beaulieu-2008]]Beaulieu, Jeremy M. et al. "Genome size is a strong predictor of cell size and stomatal density in angiosperms." New Phytologist. 2008. [[gregory-2001]]Gretory, T. Ryan. "The Bigger the C-Value, the Larger the Cell." Blood Cells, Molecules, and Diseases. 2001. [[toms-hardware-2014]] "Why Titanfall's Install Requires 48 GB: Uncompressed Audio." Tom's Hardware. 2014. [[everywhere-2013]]Reddit user west_of_everywhere. " Comment on How come there's a Amoeba with 200 times larger gene set than humans?" Reddit. 2013. [[gregory-2007]]Gregory, T. Ryan. "The onion test." Genomicon Blog. 2007. [[mattick-2010]]Mattick, John. "Video Q&A: Non-coding RNAs and eukaryotic evolution - a personal view." BMC Biol. 2010. [[parish-2014]]Parrish, Kevin. "Why Titanfall's Install Requires 48 GB: Uncompressed Audio." Tom's Hardware. 2014.